Ali’s life was transformed – and now he’s giving back. Ali’s life has been profoundly affected by Canadian generosity. What we didn’t expect to learn was how his community had been transformed by his. When we first met Ali, we sat down with him to learn how his family’s life had been changed because of Canadian generosity. It certainly had been. “Before I joined the program, it was very difficult to feed my family,” he told us. As a farmer and part-time tailor living in a remote community in Uganda, Ali struggled to feed his six children more than once a day. Ali and his wife couldn’t grow enough food from their farm and they didn’t know how to properly store food to last during the harder months. Through Canadian Feed The Children’s local partner CEDO, Ali was invited to join a farmer field school where he was taught how to grow more food with drought-resistant seeds. 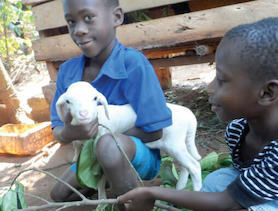 He was given the materials to build a storage unit so he could store his yield and feed his family throughout the year. 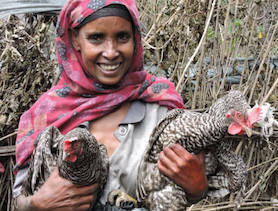 “Since I started growing the drought-resistant seed, my harvests have increased significantly from an average of 5 bags an acre to 10 bags per acre,” Ali explained. 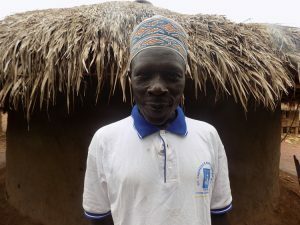 His wife Mary joined a Village Savings and Loans Association to help make sure that the profit Ali was earning from farming and tailoring was maximized for the family’s benefit. School fees for their children had been another big challenge. Plus, the nearest school was too far for their youngest children to walk to safely. Thanks to Canadian donors, CEDO was able to build a school that was closer to Ali’s home. Three of his children became supported through Canadian Feed The Children, and all of them receive a healthy midday meal at school. Ali’s family’s life had been changed forever. But then we learned what he was doing in return. 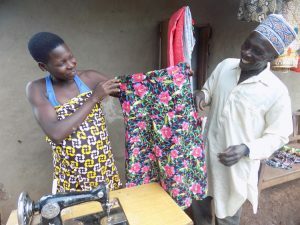 “With the profit that I’ve earned, I plan to buy another sewing machine so I can train more young girls in tailoring,” he explained. We asked him what he meant. He told us, that throughout it all, he had managed to train 8 teenage girls who had dropped out of school in tailoring. In between his hard work on the farm – growing enough food to feed and support his family – and tailoring on the side, Ali had been busy helping his community too. By providing teenage girls with a livelihood, Ali has made sure they are able to earn enough money to take care of themselves. 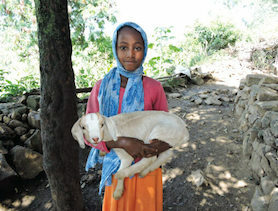 This has stopped them from being forced into early marriage – saving them from the perils that come with it. With his family’s basic needs met – thanks to the generosity of Canadians – Ali is using his own skills to pay it forward and transform his community himself.